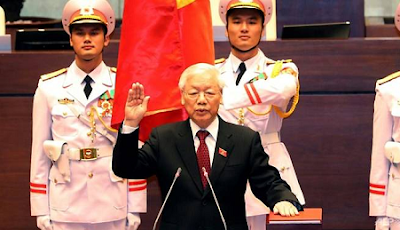 Vietnam lawmakers today elected as president Communist Party chief Nguyen Phu Trong, the only candidate on the ballot, making him the most powerful man in the country where consensus leadership has traditionally kept strongman rule in check. Trong was ushered into his new role as head-of-state with 99.8 per cent of the vote from Vietnam's rubber stamp parliament members a month after the former president died from a prolonged illness. Though the president's role is seen as largely ceremonial, 74-year-old Trong will maintain his position as party head - the first person to hold both roles since revolutionary leader Ho Chi Minh in the late 1960s. His new position was cemented in a tightly orchestrated swearing-in ceremony on Tuesday after an overwhelming vote from 477 lawmakers, with only one vote against, according to the government's website. "I, president of Vietnam vow to be completely loyal to the nation, people and constitution," Trong said at the ceremony, speaking beneath a large bust of Ho Chi Minh. "This is a very huge honour, while at the same time, a very heavy responsibility for me," he added, acknowledging his advanced age.